A steady rise in obesity prevalence over several decades has led to considerable scholarly interest in its causes and consequences. 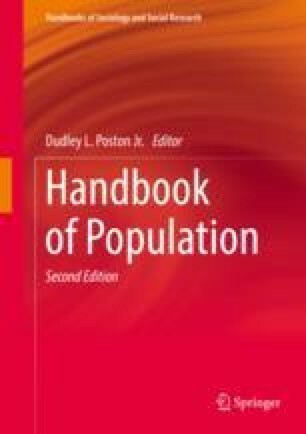 Demographers have contributed a great deal to this body of research by examining variations within and across populations, establishing its link to mortality and morbidity, providing forecast and projections of future levels, and considering how its’ presence is variable by demographic characteristics. This chapter begins with a review of overall global trends in obesity and a discussion of the evolution of research on this topic – including background on the measures used to track obesity prevalence. Next, it offers a summary of how obesity varies by key demographic variables, followed by a discussion of its health and social consequences. Population shifts that contribute to increased obesity prevalence are considered next. The chapter concludes with methodological approaches and challenges, as well as future research directions. Cao, B. (2016). Future healthy life expectancy among older adults in the US: A forecast based on cohort smoking and obesity history. Population Health Metrics, 14(1). DOI https://doi.org/10.1186/s12963-016-0092-2. Palad, C. J., & Stanford, F. C. [Letter to the editor]. (2018, July). Use of people-first language with regard to obesity. The American Journal of Clinical Nutrition, 108 (1), 201–203. https://doi.org/10.1093/ajcn/nqy076. World Health Organization (WHO). 2018a. Obesity and overweight fact sheet. Retrieved from http://www.who.int/en/news-room/fact-sheets/detail/obesity-and-overweight. World Health Organization (WHO). 2018b. Controlling the global obesity epidemic. Retrieved from: http://www.who.int/nutrition/topics/obesity/en/. World Health Organization (WHO). 2017. The double burden of malnutrition. Policy brief. Geneva: World Health Organization. Retrieved from http://apps.who.int/iris/bitstream/handle/10665/255413/WHO-NMH-NHD-17.3-eng.pdf?ua=1.